Disturbing (to say the least) movie from director Darren Aronofsky about four ambitious people who watch their lives go down the drain when their drug addictions go out of control. Meanwhile, the mother of one of those young men, living in her own Brooklyn appartment drifts into a dream state after getting hooked on diet pills. The actors give it their best, and director Aronofsky desperately tries to picture the struggle of these young people on a daily basis, but it all adds up to zero (though the movie has many loyal fans). Spending time with those drug addicts is no fun at all. Depressing and disappointing, to put it mildly. And you know that I am one of those fans:) We talked about that before 😉 It’s real and raw! haha i know i know :p ur one of the many fans I know who probably want to kill me for giving it such a low rating :p but seriously, I usually don’t like movies about drugs or people doing drugs! So I have my reasons. I know many people who hate me for giving this one such a low rating, but it is true, I couldnt stand watching it. It may be a masterpiece to some (just like Taxi Driver and The Shining), but not for me. I think the mother was the most interesting character in the movie tho. She earns an extra star :p but hey u said I was doing great b4 this, so I guess u agree with me with most of my other ratings? Thats impressive id say! call me a dead person. 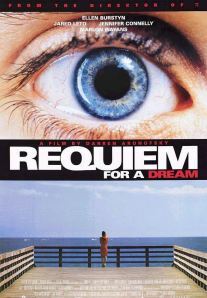 I’ve never considered Requiem as depressive as many people do. I watched it, I felt nothing. not even connected to the story or the characters. although I liked Aronofsky’s ambitious direction, the film had no impact on me. it’s a fine movie, but it is so overstuffed and over-everything. One of the most overrated movies of all time. Enough said! I think u would have to add me to this list of fans u talked about. I feel obliged to say that even if u didn’t like the story, this movie deserves at least more than average, regardless of its concept or the message it gives (though its a pretty positive one). The acting, the the sequence of events, and beyond any doubt, the music are superb. The chemistry of the latter one with the events of the movie is EXCELLENT and its what made me watch this movie innumerable times. I definitely don’t agree with the rating. Yes it is disturbing, but it’s one the very few movies that are quite genuine. He builds up the plot perfectly. Surely deserves more. ah dude my friends hate me for giving this such a low rating!